One of my longest ongoing performance improvement projects is, of course, my garden. 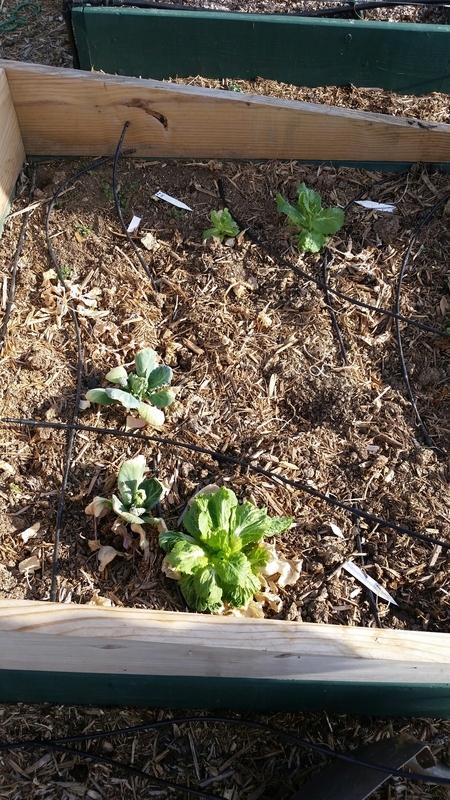 As such, I figured I should post a few updates about my garden, including how I’ve improved some approaches to make my garden “better” this year. “Better” as measured for my garden includes higher yields and better quality output. Update 1: tomatoes! They have the most radical “improvement” – or at least, I am hoping it will be an improvement. I haven’t harvested any tomatoes yet, but I am hopeful. I am following the radical guidance in the “Tomato Secrets” article from a recent issue of BackHome Magazine which promotes a very aggressive pruning strategy but only for the leaves. The suckers that grow in the “crotch” or join between the main stem and a leaf – those get to stay, because a lot of times they do produce fruit if you let them go long enough. This is backwards from most pruning guides and my tomatoes look very awkward and leggy as a result. But I’m happy to try anything (well, almost anything), at least once. These jelly bean tomatoes are being woven back and forth through painted PVC bars for support. Last year we used a wooden trellis that had to be destroyed at the end of the year because it had weathered so badly. Hoping that the PVC structure can be reused over multiple years, reducing the cost and time to set up each year. 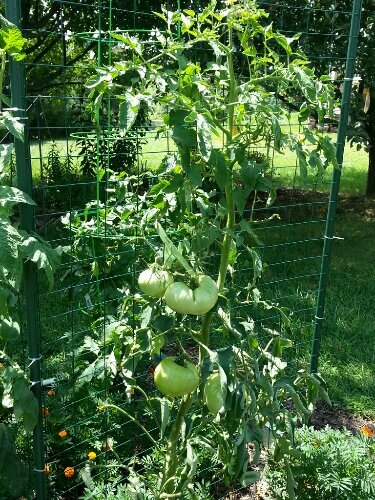 For the slicing tomatoes (a San Marzano roma, a Better Boy hybrid and a beefsteak hybrid), we re-used the “artificial fence” concept from last year. Although we did change it up, using plastic “chicken” fence with much smaller holes than last year. This gives me more options on where to tie off the tomatoes for support. This view shows the San Marzano (which is indeterminate – all my tomatoes are indeterminate this year). This view shows the Better Boy (left) and Beefsteak (right). Both are still very “leafy” because the BackHome article is very clear – once fruit has set and is about the size of a pea, you remove all the leaves below that. 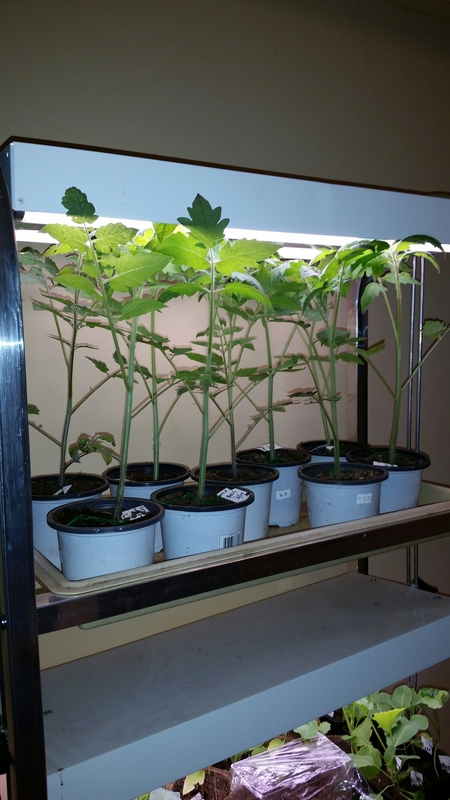 Well, each of these plants has only set a few fruit, near the bottom! Last but not least, our other major change this year: a cute popup greenhouse. (Which may not survive the year, given the nasty storms we’ve already had this summer.) Three tomatoes are in containers in the greenhouse, to protect them from the fluctuations of local rainfall and the ravages of the wind. Oh yeah, and tomato hornworms. A family portrait: two more San Marzano Romas. There are two other tomatoes which aren’t shown here. One, whose variety I forgot, is in a container on our back deck. 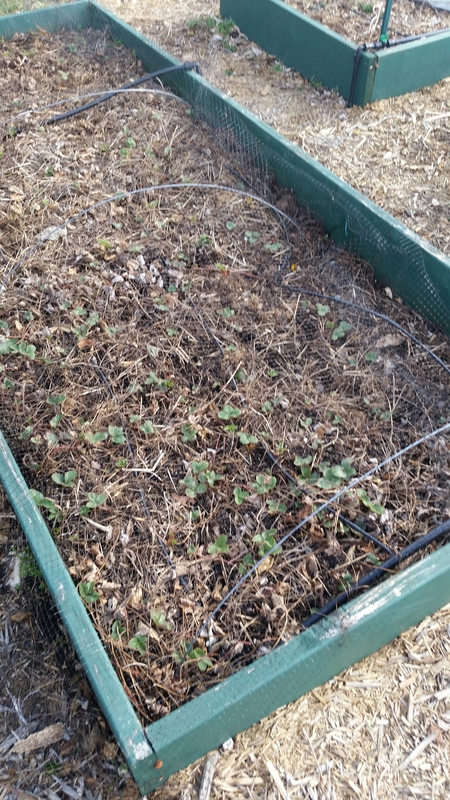 The other “volunteered” in the middle of our strawberry patch, and I didn’t have the heart to pull it up after it had grown big enough for me to realize it was there! Categories: Gardening | Tags: continuous improvement, tomatoes | Permalink. So the latest issue of Grit features an article “Four Easy Ways to Stake Your Tomato Plants.” One of them even sports a cool name – the “Florida Weave”. Well, how I am staking my plants isn’t “easy” by any stretch of the imagination. But I thought I would share, since so far they have worked REALLY well. Complicated stake 1: The cherry & grape tomatoes – which might as well be weeds because they just keep growing, and growing, and growing – are woven through a structure my husband built specifically for this purpose. It’s very sturdy and reinforced at the top corners because of the fierce winds we get through our yard. 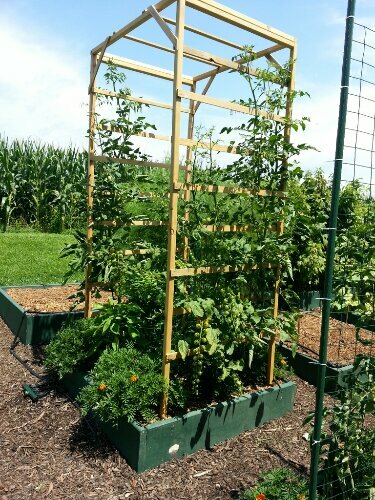 There are three plants on each side, one cherry and two “jellybean” grapes (one red, one yellow), and they are woven through each layer of the trellis as they grow. The plants will eventually grow across the top. The space underneath features marigolds and pepper plants. 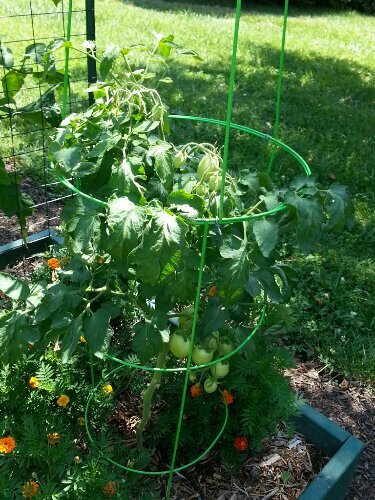 Cherry and grape tomatoes “staked” with a trellis-like structure. Beefsteak tomato spread eagle on an artificial fence. Brandywine tomato spread eagle on a “fence”. And a not-so-complicated stake, to round out the post. 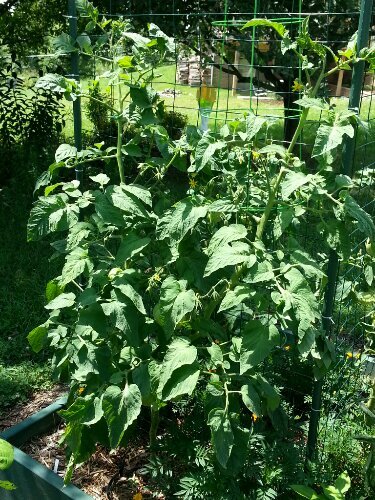 Here’s my last tomato plant – no complicated staking for the Roma. It’s the only determinate tomato variety in the garden this year, so it’s only got a double-stacked cone cage. Roma tomato in a standard cage available at hardware stores. The pieces of “fence” supporting the Brandywine and Beefsteak form an “L” shape, and the Roma is planted in the space inside the “L”. For fun, I dug up this picture of my cherry tomatoes from last year. The poor things WAY overgrew their folding tomato trellis, and became a nightmare to care for. I let them go rotten on the vine rather than trying to reach in that mess to try picking them! 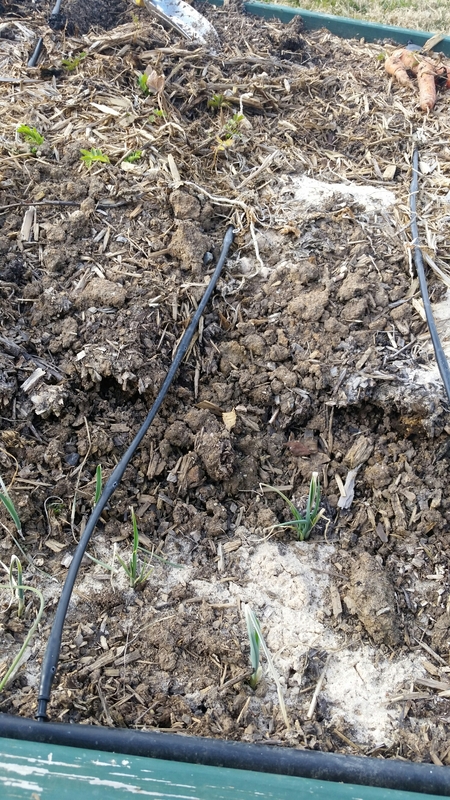 So maybe my stakes are over-engineered…now you know why! 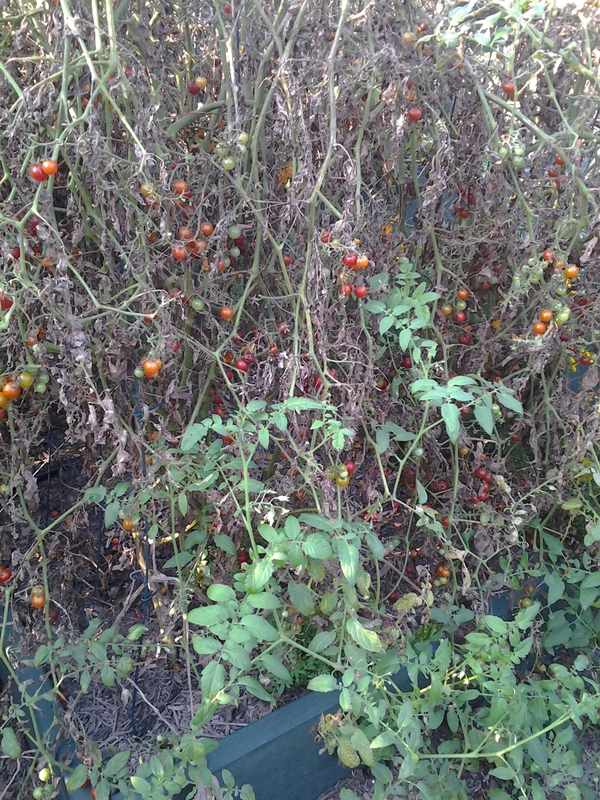 Categories: Gardening | Tags: tomatoes | Permalink.